Follow me on Instagram for previews, behind-the-scene images and random daily life things. 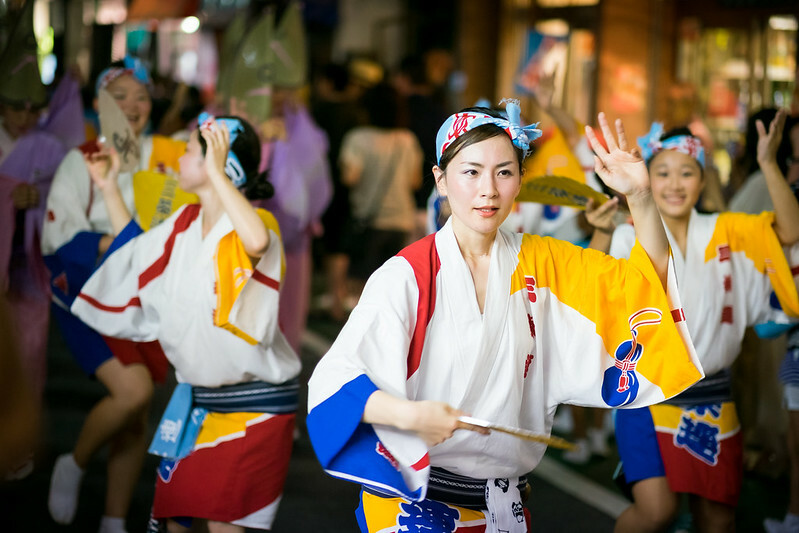 Awodori (阿波おどり) is a type of Japanese festival held in August, during which teams (called “ren”, 連) of dancers parade through the streets dancing and singing on a song called “yoshikono bushi” (thanks to Coal in the comments section for the name), accompanied by musicians playing the shamisen, the shinobue flute, the kane bell, with taiko drums to set the tempo. Then why not dance too? 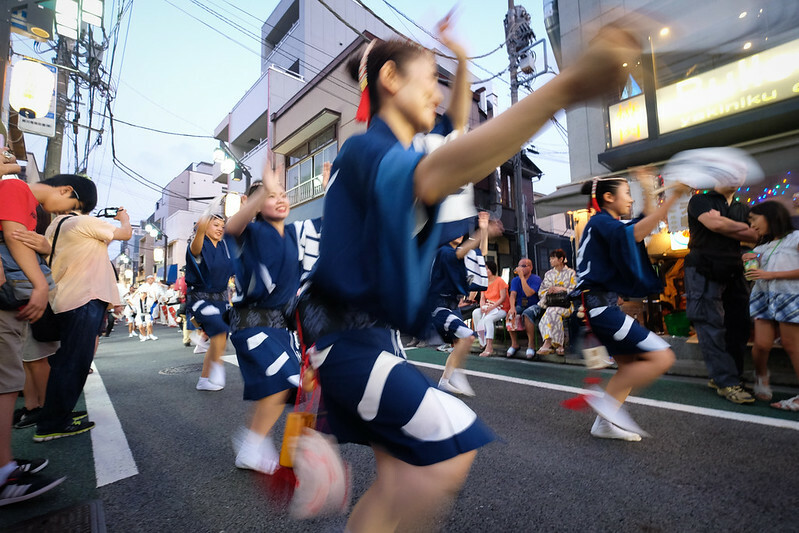 The biggest Awaodori festival is held in Tokushima during the Obon holiday, but I did not have the chance to go there yet. 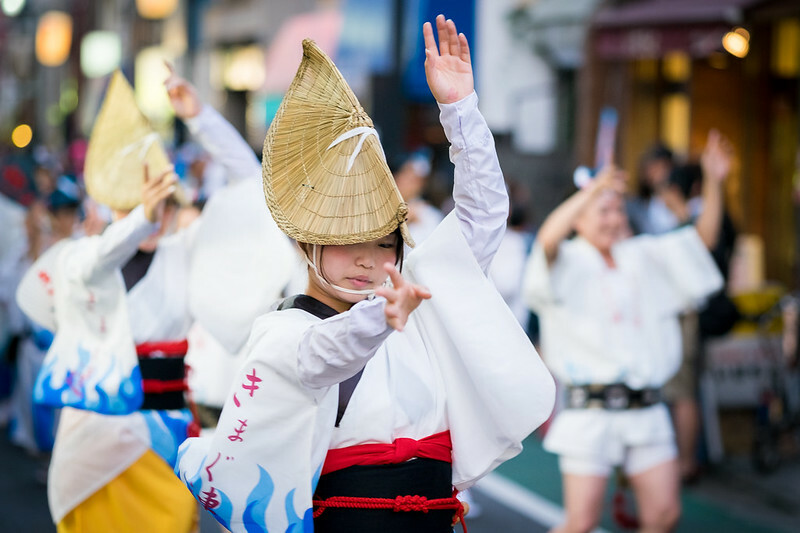 However, there are many Awaodori held in the Tokyo area during the whole month, with some very skillful teams. 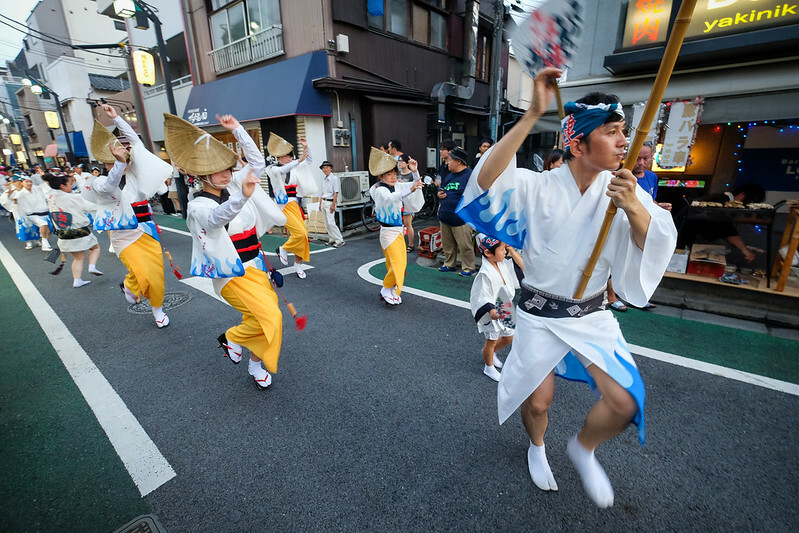 The best-known is the Koenji Awaodori, which is held at the end of August, but be ready for an over-crowded event with some people marking their spots with blue tarpaulins with their name on it gaffer-taped on the side of the street way in advance (would not try to reserve my spot like that outside of Japan 🙂 ). I tend to prefer smaller events, which enable to be closer to the team and to sometimes catch them when they are more relaxed. 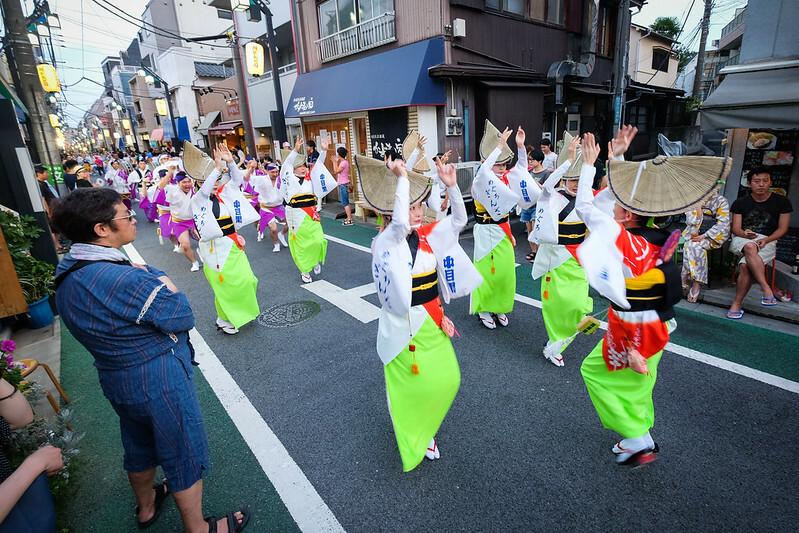 The Shimokitazawa Awaodori is a good example of human-sized Awaodori that will enable you to approach the dancers and improve your knowledge of the different teams, with their different styles. There are not bazillion teams, but at least you get to remember their names and colors. I have to say my favorite one was the Yattokoro-ren (やっとこ連), and I will be looking for them in future events. Having said that, the streets close to the train station will be very crowded as well. 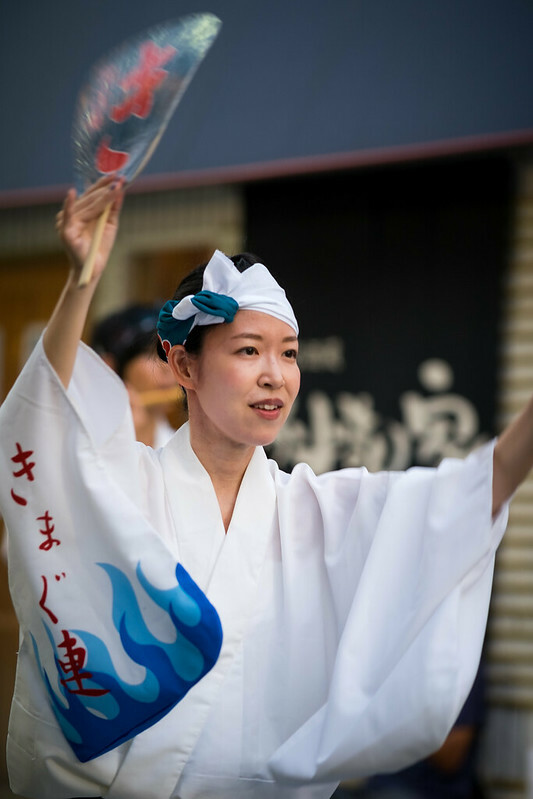 That is where you want to be if you want to enjoy the joyful spirit of the events, with spectators dancing on the sidewalk with some yakisoba or yakitori in one hand, and a beer in the other hand. 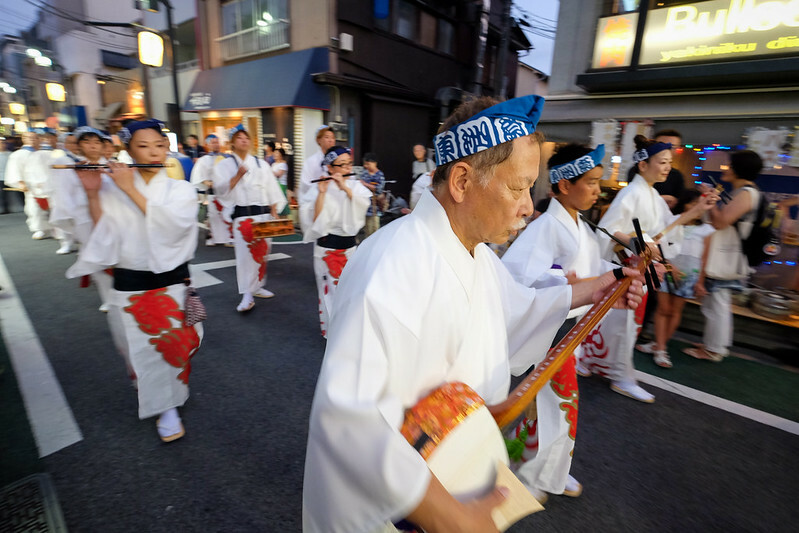 This year was a special one, as it was the 50th anniversary of the Shimokitazawa Awaodori (which is a young age as far as Awaodori festivals go). Before joining the party myself, I first wanted to get some pictures of the event. Following the advice of Tokyobling, I positioned myself as far as possible from the train station, almost at the end of the street, where there are much less people on the side and less people jumping in front you to take their picture, which offers a much more pleasing experience for photographers. I stayed on the side of the road the whole time, which does not offer a nice variety of images and point-of-view, but I felt I had no business popping out in the middle of the street and risking ruining the experience of both performers and watchers, though some people would occasionally do it. I shot with 2 bodies. My main one was the Fujifilm X-T1, with initially the new XF 90mm F2 mounted on it. 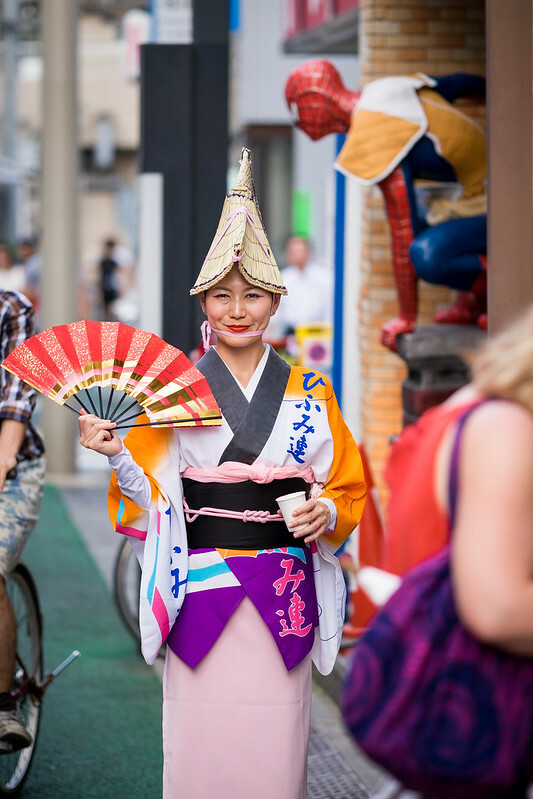 But I quickly switched to the XF 56mm F1.2 and XF 35mm F1.4 as I realized even from the sidewalk I was so closed to the action I need a wider focal length. 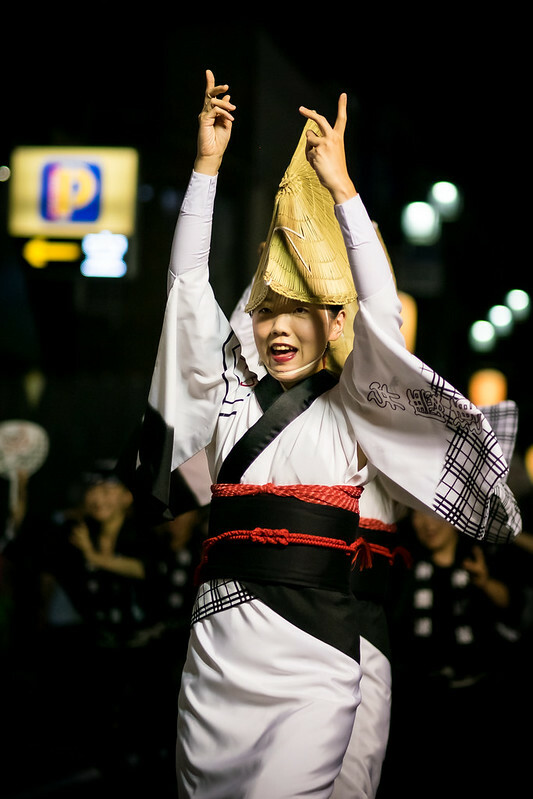 The wider aperture was also useful, as the event takes place in the evening in streets with very limited light. 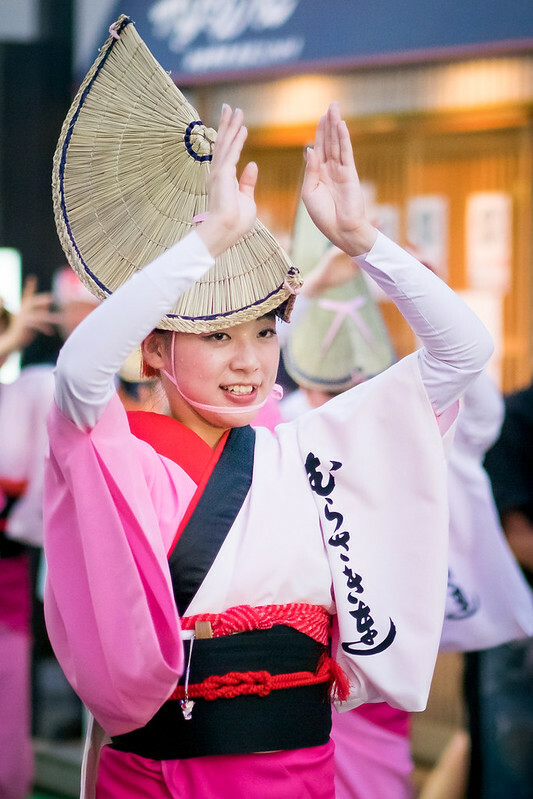 My objective with this body was to get some portraits of the dancers, and especially the dancers wearing amigasa hats (編笠, the half-folded circular-shaped straw hat). 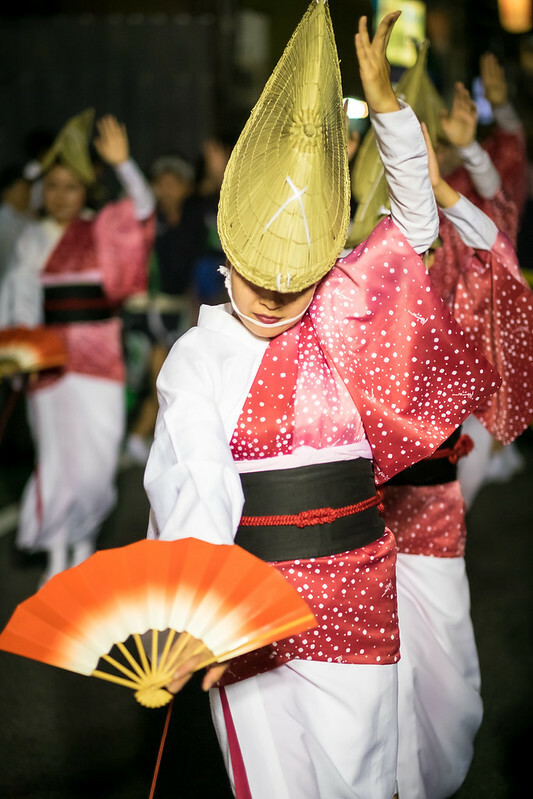 I used the Firmware 4.0, hoping to benefit from the focusing improvements, but overall I struggled nonetheless to get continuous focus on erratically moving dancers in dim-light, though this might be totally due to my own ignorance and lack of experience with the new Fuji focus modes. I used the Fujifilm X-E2 as my second body, with the XF 10-24mm F4 mounted on it. 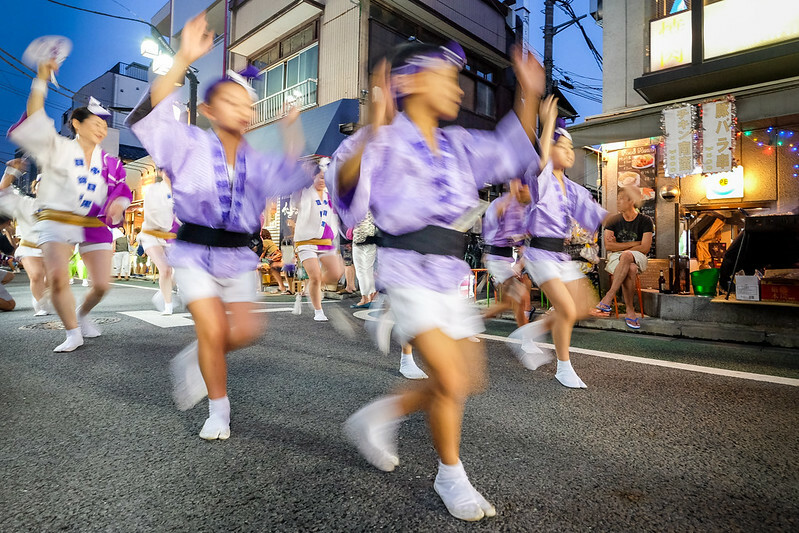 I chose the wider zoom because it is stabilized and I wanted to capture the groups of dancers passing by with a slightly slower shutter speed to capture some movement. When I got home and transferred the files to my computer, I realized that I had been shooting JPEGs the whole night with this body, a setting that I had probably used for my previous shoot and forgot to change back. I reckon it also happens to me oftentimes to start shooting in broad daylight at high ISO because I forgot to check it and change it back after shooting in low light the previous day, I should pay more attention… Anyway, at least I have some images, so not such a big deal. In fact, several of these shots ended up among my favorites of the night. I went back on the Sunday for the dance contest, that sees the different teams compete in different categories in front of a jury. 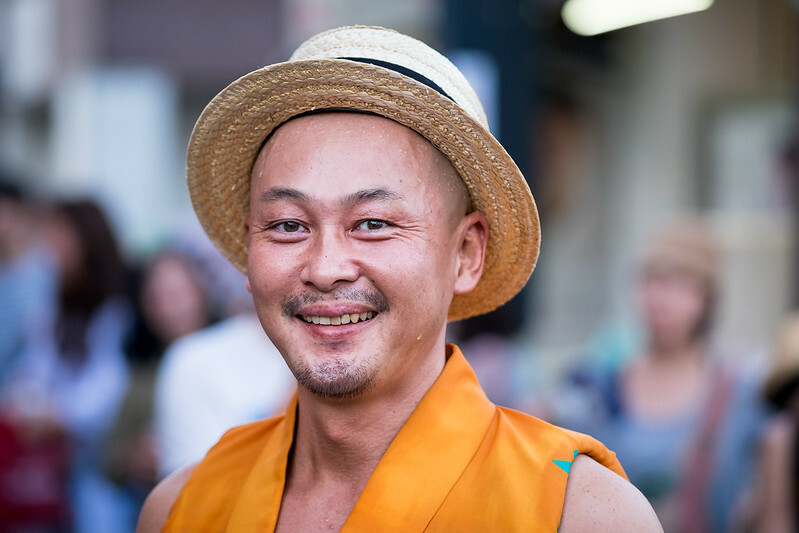 Since there was no parade, I brought only the X-T1 with me, with the XF 50-140mm F2.8 zoom to have some flexibility, and the XF 90mm F2 to shoot some portraits on the side of the street. 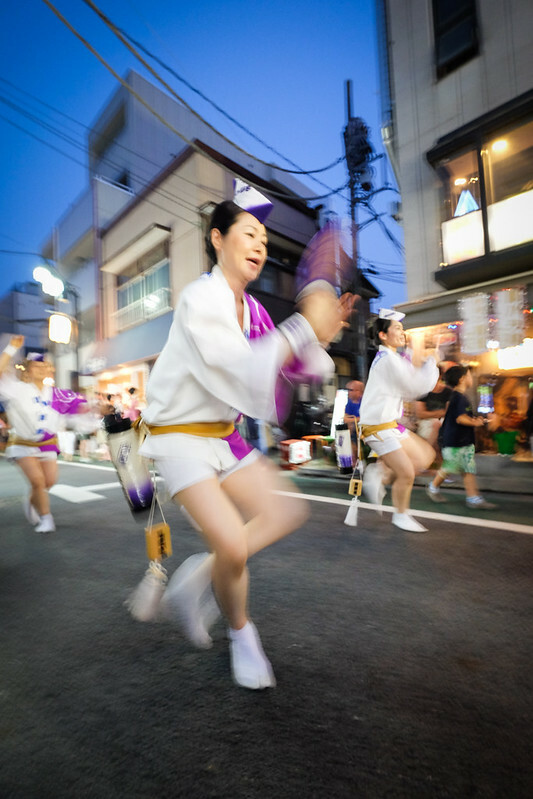 I might go to the Koenji Awaodori at the end of the month, but I have not fully made up my mind yet. Will depend on the weather and if I can get a spot that is not completely obstructed by other people. Great photos, well done. I should have told you about the best lenses to use, I started out with my 50mm prime when shooting Awa but now almost only use my 17-35mm zoom. The same advice goes for Koenji. If you want to avoid the “accredited photographers” getting in your way the smaller side street parts are the best, and as far from the station as possible. Especially if there is a light rain, when they almost empty out completely. 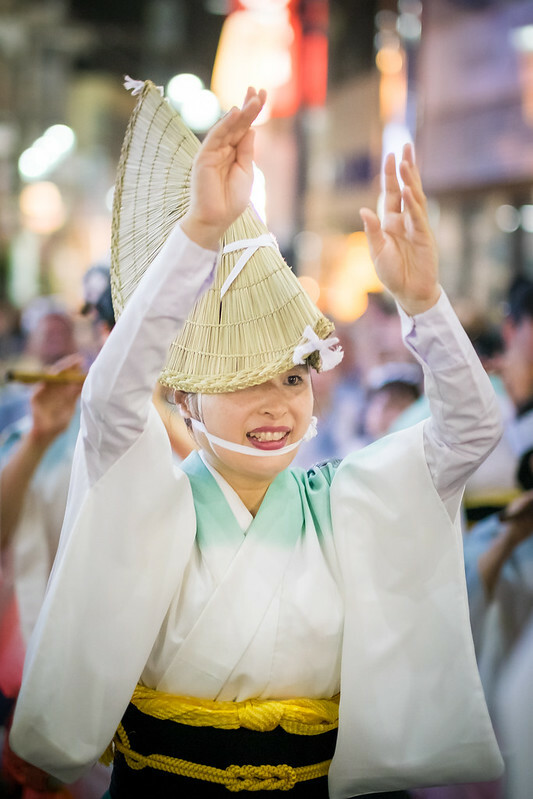 If you want to use your longer lenses I recommend the Minami Koshigaya festival this weekend, it allows for far longer perspectives due to the long a wide embujo. Haha…. I do the same thing with the ISO as you do, but I am getting better at remembering it! 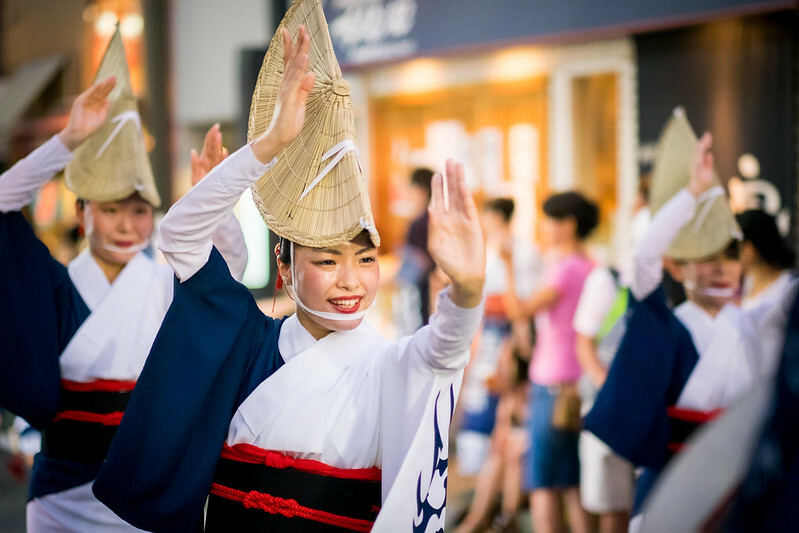 Always good to see interest shown in Awa Odori. 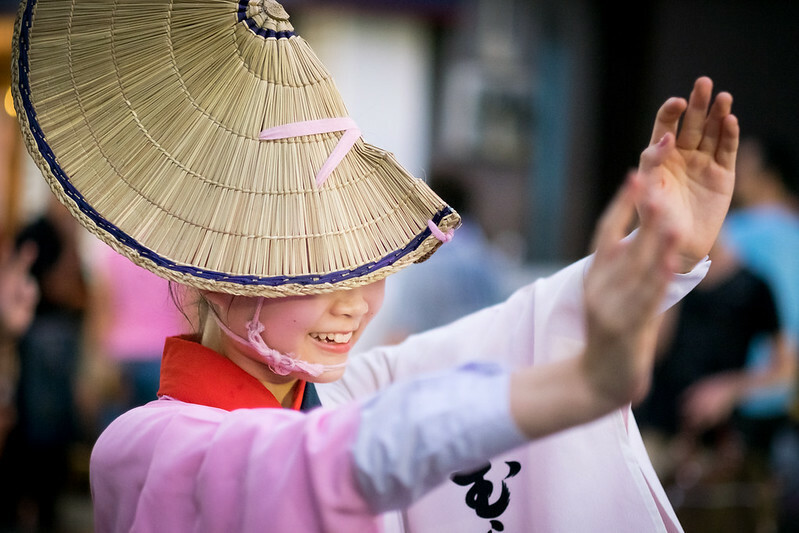 There are some nice pictures here, which emphasise the humanity of the performers. The slower shutter speeds also highlight the sense of movement quite effectively—part of the aesthetic of the dance centres around seamlessly blending motion and stillness, so I find it’s better to work with a fixed shutter speed (between 1/50 and 1/125) so you get the best of both worlds, but I’m by no means an expert. 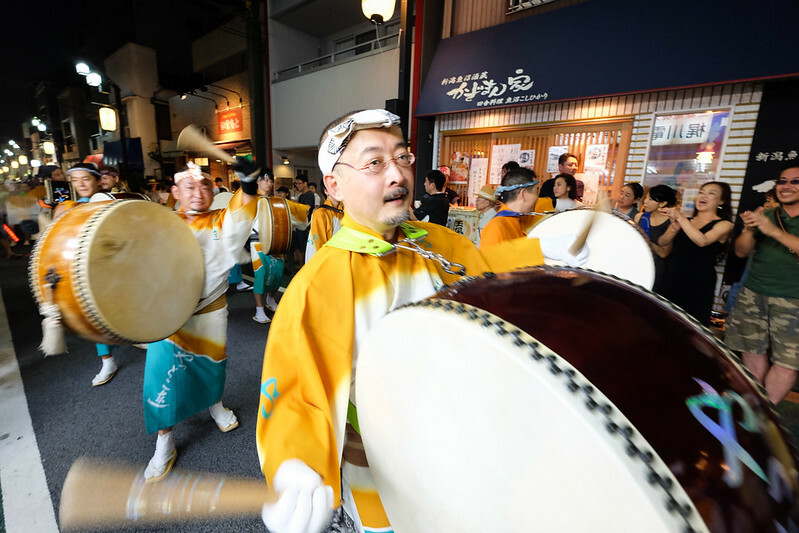 • The folk song is called the “yoshikono bushi” or “yoshikono” for short. The flute melody should be very familiar. Be wary of teams that don’t use this melody, as they have all the authenticity of alcohol free beer. 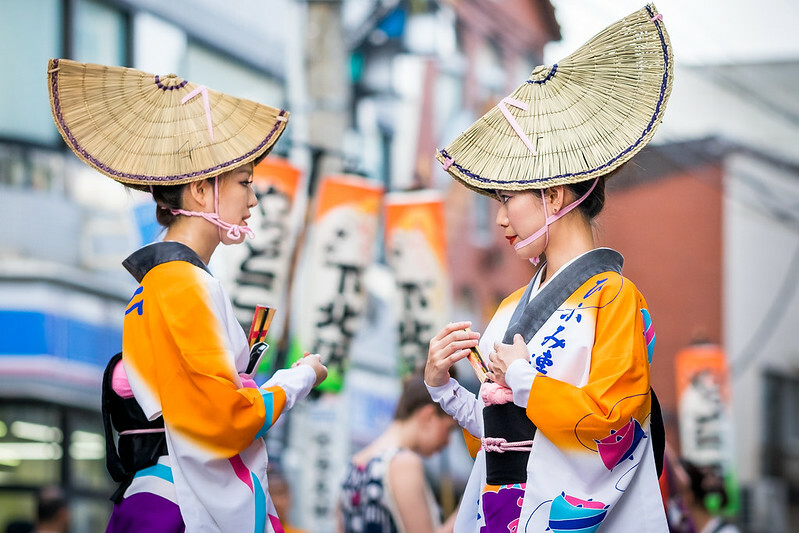 • Awa Odori as a brand, so to speak, is typically written as ‘阿波おどり’. 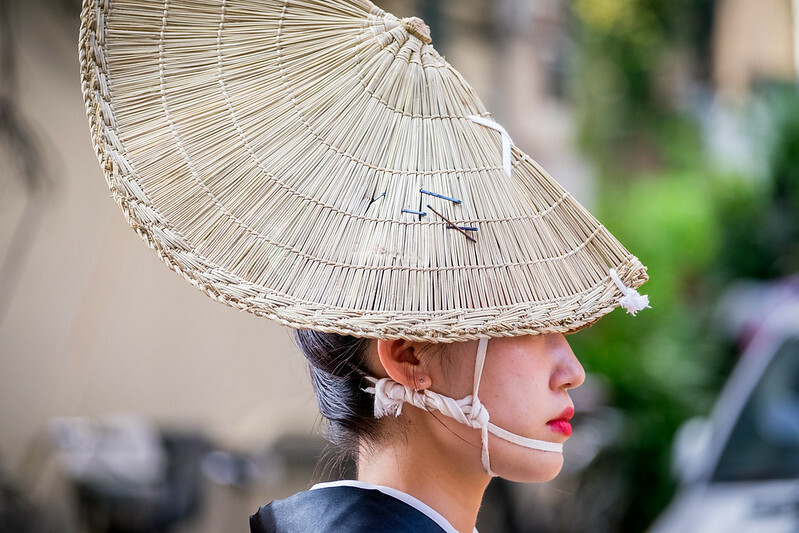 Some outliers write it as ‘阿波踊り’, but they’re wrong. • The flute is called ‘shinobue’. 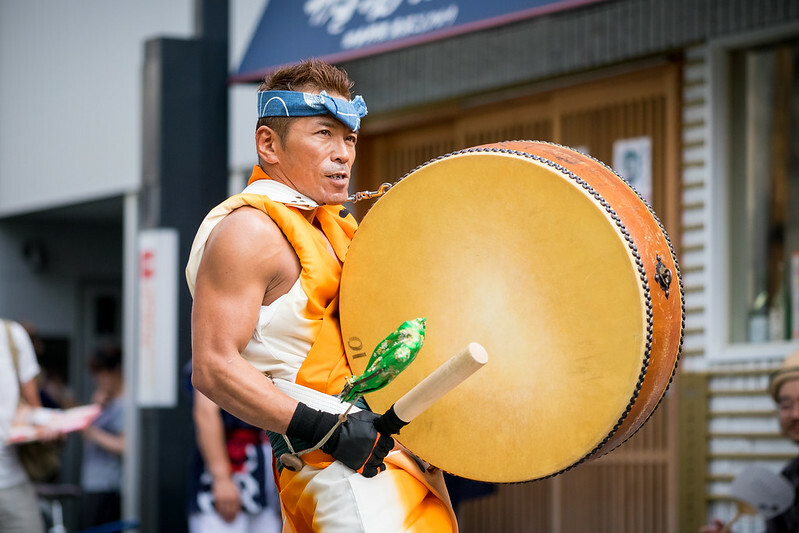 Tensuiren, one of the top Tokushima teams and in no way affiliated with Tokyo Tensuiren, have their own flute maker on team, and they get to use their own branded flutes which are called something else. I’ll ask one of their flutists next time I run into one. Thank you very much for sharing all these additional details! 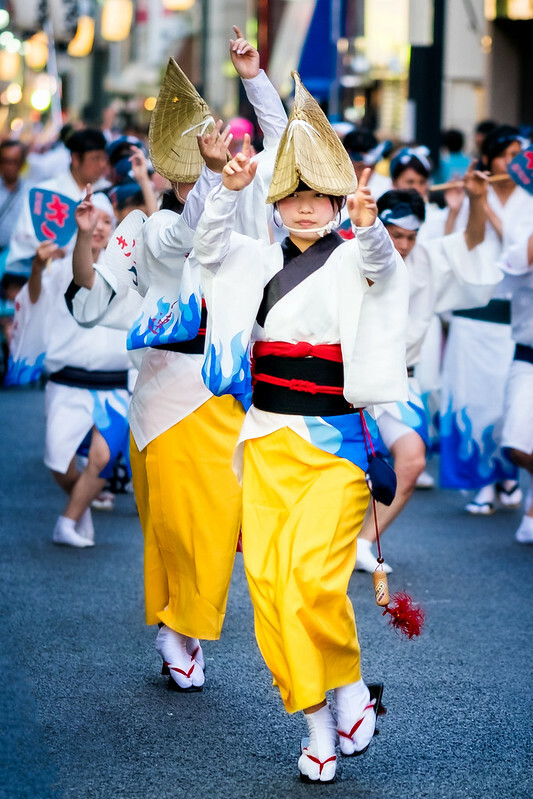 I am pretty much a newbie in Awaodori, but hope to broaden my knowledge along the road. I corrected the errors you pointed out.